DFQ-100W drilling rig is a light weight, high efficiency and multi-functional drilling equipment,it adopts rubber crawler, will not damage the roads, self-propelled transitions,convenient and quick. It is widely used for water well drilling,geothermal air-conditioning project and other boreholes, especially applicable to mountain area and rock formation water engineering. 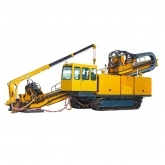 Much higher efficient than the traditional rotary drill rigs, creating the considerable economic benefit for users. Especially solve the problems to drill very hard rocksthat the traditional rotary drilling rig meet, DFQ-100W drilling machine is able to work efficiently under all kinds of geological conditions.